Click HERE for the 2018 RAM ride schedule. The Spring City Cycling Club will kick off its 15th annual Ride A Metric (RAM) training series on May 5, 2018. 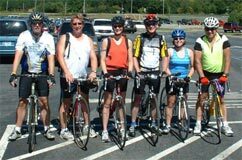 This training series will help participants progress from neighborhood or casual riders to cyclists who are confident about riding on the road. This program is intended to prepare riders for the SCCC All You Can Eat Metric Century (100 kilometers) on September 15, but is also an excellent development program for those who wish to ride shorter distances on the road. The RAM series is a collection of weekly rides that help cyclists advance their skills and ride longer distances as the weeks go by. The initial rides in May will be held on Saturday evenings, but starting in June the rides will be part of the SCCC Saturday morning rides calendar. Supplemental weekday ride opportunities will be available to the participants. Participants need to possess a serviceable bike and a moderate level of fitness. The series will teach riders to be more confident and more efficient. Pointers will be provided on how to prepare for longer rides and the necessary equipment. Learning to cycle in a group will provide both social and physical benefits. Wednesday April 25, 6:00 p.m.